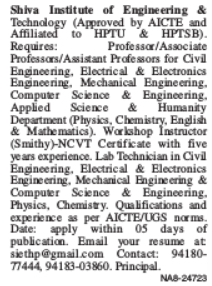 Shiva Institute of Engineering and Technology, Bilaspur has advertised in the TRIBUNE newspaper for the recruitment of Teaching Faculty- Professor / Associate Professor / Assistant Professor Plus Non-Faculty jobs vacancies. Interested and eligible job aspirants are requested to apply within 05 days from 18th July 2018. Check out further more details below. About College: Shiva Group of Institutions was started in the year 2007, commencing with Shiva College of Education under the aegis of Shiva Education Society. This was the first college of education (B.Ed) in Distt. Bilaspur. Now it is NAAC accredited and running with the intake 200 seats. How to Apply: Interested and eligible candidates are requested to send application along with CV, copies of certificates (marksheets, PAN card, Aadhaar card, Degree Certificates) and recent passport size photo the email address given below.